Jess enjoying the hot off the grill Margherita pizza. Finally! San Diego has been sunny again as April showers, May gray and June gloom have, for now, taken hiatus. What does this mean for me? It means I can start, in earnest, to enjoy the fruits of my labor: My little oasis that is my back patio. The new seating area on my back patio. I sit here almost every evening when I get home from work to check my email and unwind with a glass of wine or freshly brewed latté (depending on my stress level!). After living at the place I rent for nearly five years now, I've finally gotten around to clearing out the clutter in the back space that is my backyard. 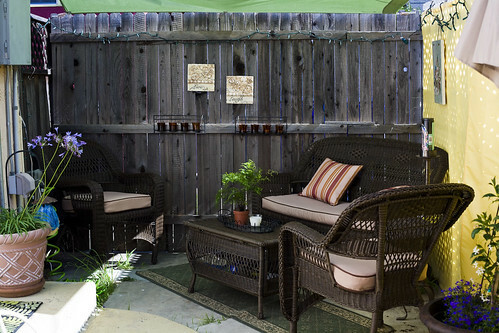 Mid-May I hired someone to haul away the junk and I started the quest to find items to fulfill the idea I had: a seating area on one side and a dining area on the other with a little herb garden and as much privacy as I can finagle. It isn't easy decorating on a limited budget but I found most of the bigger ticket items on sale. I've had a friend here and there over while the patio had been in progress but last weekend I finally arrived at a point where I felt like I was nearly finished. So the only thing to do next was to have someone over for a meal outside. With a broken oven and an especially warm run of weather, I opted for making the meal outdoors. The challenge was that I really wanted pizza. Hmm. My last attempt to make pizza on the grill wasn't such a success. 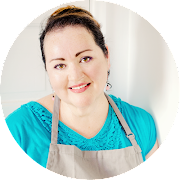 My friend Darlene over at My Burning Kitchen was the guinea pig that first time around and we wound up with more than slightly charred, slightly dry pizza. You can read about it here. Uh, one small aside: she was far too kind in the her comments on the edibility of our meal! My friend Jess was my guinea pig this time. Armed with the lessons learned from my first attempt, the biggest difference between then and now: My ever faithful, often used, Pampered Chef pizza stone. The second one, keeping a better eye on the pizzas while they baked in my gas grill. They cook fast! I've had this stone for more than 8 years now and it's nicely blackened with age. The key to a good stone: use it! Just like a hand-hammered wok (another must have item! ), the blacker it gets, the more naturally nonstick it becomes. I can use mine for baking cookies now without the need to use a nonstick cooking spray. The cookies come out absolutely wonderful. The lack of the added oil keeps the bottom of the cookie from getting that slightly chewy crunch that I hate which burnt oil and butter can impart. But I digress. Back to pizza! "Really special," says Jess after taking the first few bites. 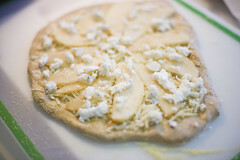 This Pear & Gorgonzola pizza was so yummy that I forgot to take a photo when I pulled it off the grill. We just immediately dove right in! 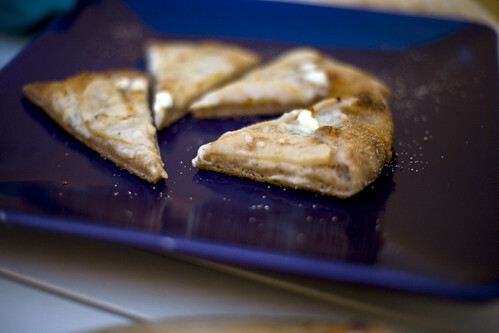 I decided to take on a pizza flavor I had a few years ago at a local wood-fired pizza joint: Pear & Gorgonzola. Since it's been a while since I've had it, I don't quite remember what all was on the pizza but I knew I wanted to keep the flavors clean, fresh and tasty. Gorgonzola, like most bleu cheeses, can be oft-putting to some people which is why I think the pear/gorgonzola pairing works so well: the slight bite from the gorgonzola is mellowed by the juicy sweetness of the pear. Since I wasn't sure of Jess' position on this particular cheese (or bleu cheese in general), I made the decision to add some fresh ricotta to the pie and to use whole wheat pizza dough to further mellow the flavor. I think it was quite successful. Speaking of pizza dough, I used the same Trader Joe's whole wheat pizza dough that I used the last time around. I love this stuff! It's so versatile. I've used it for foccacia, calzones and bread as well as pizza. It's ready made dough and is sold in the refrigerated section. It's full of yeasty whole wheat goodness and can be easily divided in half so you can make two smaller pies instead of one unwieldy big pie. Which left me with the next quandary: what flavor to make the second one? Since I was opting for a non-meat first course, I didn't want to make a second pie with meat that could overpower the main event. 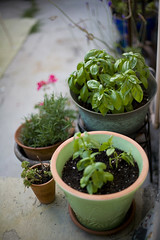 I'm successfully growing basil in my new container garden and I had recently purchased some vine ripened tomatoes. So the natural conclusion was to create my own version of a Margarita pizza. My version of a Margherita Pizza. This pie had the freshest, lightest taste. And it was distinctly different from the Pear & Gorgonzola without being overpowering. Consensus was: Mmmm-mmm! Both pies were a hit. We started off with a salad of mixed greens with sliced red plums, pine nuts, Quattro Formagio shredded cheese and balsamic vinaigrette. 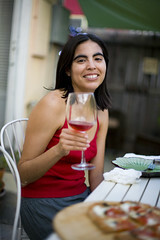 I paired the meal with a fruity slightly chilled Valley of the Moon 2007 Rosato di Sangiovese. The lovely cherry flavor really paired especially well with the pear and gorgonzola. As my friend and I concluded, our meal was like an explosion of flavor in our mouths! Dessert was provided by Jess and it was a yummy Dump Cake (minus the walnuts since, um, yes folks, I admit it, I hate 'em! ew!) that she made that afternoon for the first time. It was so tasty! After a full belly, there was only thing left to do: time to enjoy a great romantic comedy. Jess' choice from my extensive collection was one of my favorites: Hugh Jackman in "Kate & Leopold." Mmmm. Now that's what I call a great way to end an evening of successful food experiments, great wine, good conversation and fun times with a great friend. Life is good. Remove the dough from the refrigerator, remove from bag and divide in half. While the dough comes down to room temperature, it's going to get sticky so I place mine on the work surface that's been prepared with a little dusting of corn meal. 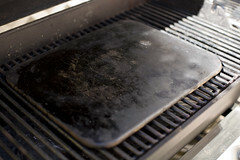 Place the pizza stone on the grill and heat the grill to 400º. While the grill is coming up to temperature, take half of the dough and with a good dusting of corn meal on the work surface (I use a wooden pizza peel), starting from the center working out, use your fingers to pull and flatten the dough into a flatbread shape of your choice. You could pull out a rolling pin and aim for a perfectly round pizza crust, but why? 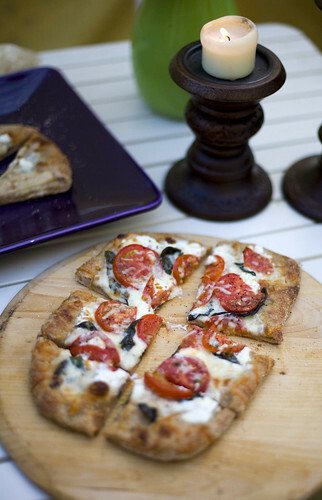 Embrace the organic rustic shape of a truly hand-formed crust. Remember, it's always OK to color outside of the lines! Next, drizzle a little olive oil over the dough and use your fingers to spread it around. Sprinkle the Quattro Formagio as evenly as you can. Add the pear in a single layer and crumble the gorgonzola over and around them. Using a tablespoon, randomly drop little clumps of the ricotta onto the pie. The corn meal on the pizza peel will make it easy to place the pizza on the grill. Just give it a quick little shake to make sure the pizza is loose enough to slide off the peel and then carefully place the pizza on the center of the stone and close the grill. Cook the pizza for 8-10 minutes checking on the pizza after 6 minutes. Remove the pizza once the cheese is melted and the crust is slightly golden. Let stand for five minutes (if you can wait that long!) and then cut and serve. Flatten the second half of the dough in the same way we did for the first pie. Drizzle a little olive oil over the dough then sprinkle on the garlic. Using your fingers, spread them around. Next, spread the Quattro Formagio cheese evenly over the crust. Sprinkle on the hand torn basil. Using a teaspoon, drop little clumps of the ricotta over the pie. Prepare the tomatoes by spreading the slices on a platter. Sprinkle them with salt & pepper on both sides. Then place the seasoned tomato slices onto the crust in a single layer. Add a little more of the Quattro Formagio over the pie and then sprinkle with a little sea or kosher salt. TIP: Timesaver ingredient: Trader Joe's! Every ingredient, save for the basil for the margarita pizza, came from Trader Joe's. I love Trader Joe's! My container garden: basil, rosemary, strawberries, patio tomato, lavender and some flowering plants. I love it! 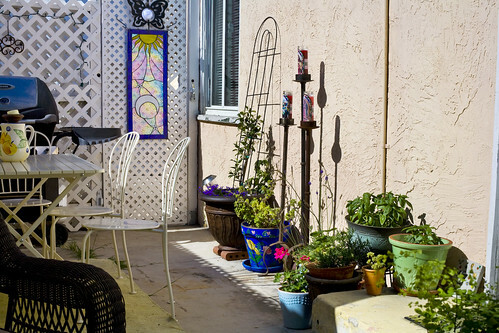 Your turn: What's your favorite meal to serve al Fresco? GREAT post! Wow, factual and fun, both. So glad you're back blogging, Ani. i have missed your posts. Your pizzas look delicious Ani! 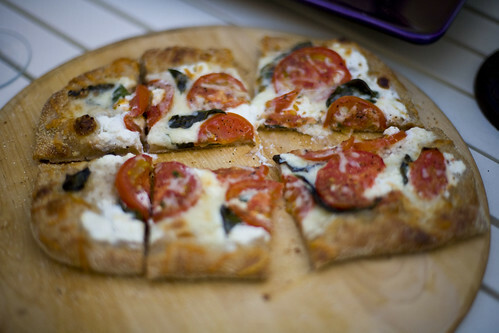 Margarita pizza is one of my favorties too. It's so quick and easy as well which makes it a great summer dinner option. I like to make what I call "Margarita Pizza with a Twist" -- it has the tomatoes, fresh mozzarella and basil, plus torn pieces of prosciutto and a sprinkling of crumbled feta. Mmmmmmmm. We seriously couldn't live without TJ's. Or at least live as happily! 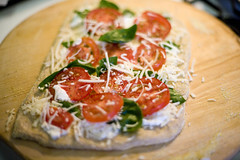 The TJ's whole wheat pizza dough and Quattro Formaggio cheese are staples in our house. I make the kids a little pizza with it once or twice a week. Glad you are enjoying your patio!